When I began writing about the spirits of the Queen Mary, I realized that it’s a topic that has been more than thoroughly covered. What I haven’t seen much of is people sharing more than the absolute basic information about the souls who reportedly haunt this amazing ship. I’ve been thinking a lot about our culture’s fascination with ghost stories. I think a lot of people have become blind to the fact that when we’re telling spooky stories about ghosts and the tragic events that often accompany them, we’re often speaking of actual people. People who had families, some of whom might still be living. It made me wonder how I would handle knowing that a loved one of mine was not only a ghost but a “famous” ghost? What if the only mention of your loved one was found in paranormal YouTube videos or ghost tours? What if the only mention of your loved one was the horrible way they died? I don’t think that people with morbid curiosities or lovers of the paranormal, like myself, mean to offend or hurt the living families of these dead people. It’s simply that there seems to be a disconnect when it comes to seeing ghosts as people who were once living, and most people don’t share information about the lives these people lived. They only focus on the death and the afterlife. The reason I try to humanize these ghost stories and urban legends is to help make the point that these people were much more than the way they died. That being said, I want to share the real story of Senior 2nd Officer William E. Stark. The tale about the ghost of Officer Stark is usually one of the staple stories told about the Queen Mary’s ghosts. An apparition of a man wearing a Cunard Line officer’s uniform has been seen in the Captain’s Cabin, as well as the Sun Deck and the Promenade Deck. Disembodied sounds of choking and gasping in the Isolation Ward have also been attributed to Officer Stark. So who was Officer Stark and how did his ghost come to haunt the RMS Queen Mary? William Eric Stark was born on the 25th of September, 1918 in Sunderland, England. By the time he was born, his father, William Eric Stark Sr, was already a Master Mariner. He served as an officer on numerous ships, including the Queen Mary. William Sr, was a mariner until he was 57 years old. William Jr got his start in sailing in 1936 when he was 17 years old. His career began as an apprentice on the cargo ship Silverpine. 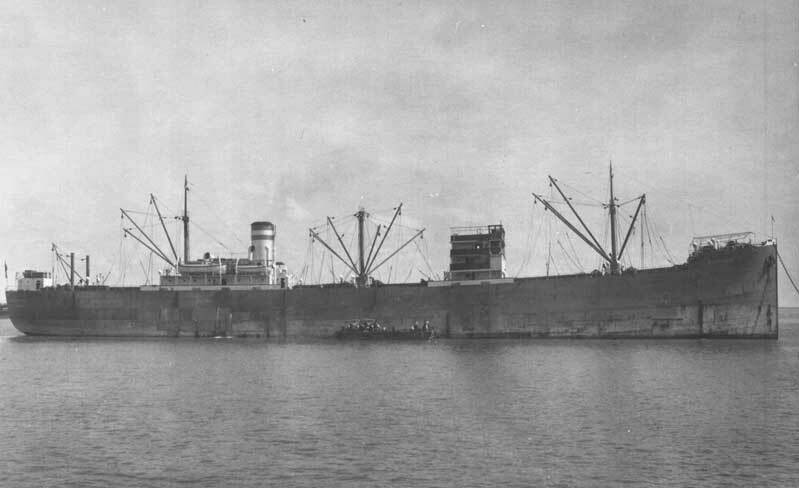 He quickly made his way up in rank, and by 1940 was a Junior 3rd Officer on the RMS Antonia. While I couldn’t figure out exactly what he did during WWII, I was able to find that he was decorated, and got married. Sometime in 1941, William married Margaret Joyce Blake in Port Said, Egypt. Margaret was a nurse, so it’s very probable they met while working on a ship. Whatever he was doing during the war, it must have been significant as he received six different service medals. By November 1947, William was now a Senior 3rd officer onboard the RMS Queen Mary. Margaret must have lived a somewhat lonely life because William was at sea more than he was home. Margaret appears to have kept busy as a midwife in Hampshire, England. By April of 1948, William was made Junior 2nd Officer, and by the following year, he would reach his final rank, that of Senior 2nd Officer. His final voyage aboard the Queen Mary took place in September 1949. The ship had arrived in New York on September 12th, 1949. It left to return to Southampton just a couple of days later. Unfortunately for Officer Stark, this voyage would not end well for him. On the evening of the 18th of September, Captain Andrew MacKellar asked Officer Stark to go to the Cabin of the Staff Captain and prepare some drinks for the Captain, himself, and two other officers who would shortly be off duty. Specifically, he asked him to make gin and limes. When Stark got to the cabin to make the drinks he couldn’t find the gin. He asked the Captain’s Steward, Frederick Stokes, to help him. In the dimly lit cabin, the two men searched for the gin, until finally, Stokes found what he thought was a bottle of gin in one of the cupboards. He handed it off to Stark who made the drinks. At 9:45 that evening, Captain MacKellar saw Stark when he came to report after doing his rounds. At the coroner’s inquest, Captain MacKellar testified that Stark said: “That was funny gin we had, sir, at dinner-time.” It was then that the Captain realized that Stokes had mistakenly grabbed the old gin bottle that now held carbon tetrachloride, which they used to clean the furniture. According to the Captain, the actual gin was kept in a separate cupboard along with the glassware. In the dim light, Stokes didn’t notice that the bottle he grabbed was dirty, was probably not the Captain’s gin. The Captain immediately notified the ship’s doctor who informed Stark that he needed to come to the ship’s hospital straight away to have his stomach pumped as carbon tetrachloride was highly toxic. From all reports, William didn’t think it was that big of a deal. Not only did he refuse to have his stomach pumped, he joined the other officers to have actual drinks with gin and lime juice. Numerous men would testify that Office Stark treated the whole incident lightly and joked it off. This is where the story of Officer Stark’s death differs from the stories that are most often repeated. By the following day, Officer Stark’s health had started to decline. The coroner’s inquest stated that he was in bed receiving injections and treatment. On September 20th, the Queen Mary arrived at Southampton. Officer Stark was immediately taken to the Royal South Hants Hospital. It appears that Stark was not comatose at this point because he was able to see and speak to his wife. She asked him why he refused to have his stomach pumped and he said: “I did not think anything of it.” I imagine that Margaret knew that he was going to die, and I can only imagine how difficult that must have been for her. Three days later on September 23rd, 1949 Officer William Eric Stark succumbed to carbon tetrachloride poisoning. He died two days shy of his 31st birthday. I wasn’t able to track down any burial records for him. According to the Queen Mary’s records, he was buried at sea. This would not have been unusual for a nautical officer. Many people believe that a person must die at a location in order for their ghost to haunt it, and that’s simply not true. Personally, I believe that many haunted places are haunted by those who loved the location, or more commonly the spirits that are seen are simply residual energies. Like a tape being replayed over and over again. For those that have seen the ghost of Officer Stark, it sounds as if he’s still making his rounds on deck, or still searching for the bottle of gin in the Captain’s cabin. I doubt that Officer Stark’s ghost haunts the Isolation Ward as I don’t believe he spent time there. I also don’t think he’s responsible for the ghostly choking and gasping sounds. Death by carbon tetrachloride is not an immediate death. From all accounts, he wasn’t choking or gasping for air. He would have suffered kidney and liver failure and eventually slipped into a coma and died. Thanks for sharing Jen! Love your post, I have a board on Pinterest for them!! Keep up the great work.